Happy Friday! I hope you've had a great week! We don't have any big plans this weekend but I am really looking forward to family time... and a mimosa flight. Today, I'm sharing my weekly roundup of what I'm currently loving. 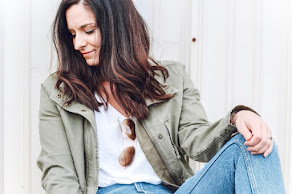 I have added lots of new fall pieces for my wardrobe and I can't wait to put them to use when the weather finally feels like fall... but it looks like we will be hanging on the eighty degree temperatures where I live. 1. S W E A T E R | This is the sweater of my dreams! I absolutely love this sweater and even though it's pricey, I think it would be a closet staple that I would wear for years to come. 2. B R O W G E L | This is one of my new favorite beauty products! I use this brow gel in the shade brown daily to fill in my brows and keep them in place. I love that it has the perfect, small brush! 3. P E P L U M T O P | How cute is this top?! It comes in tons of colors and it would be great with leggings and a bralette for a cozy, comfy look. 4. J E A N S | I own and love these super affordable jeans! I bought them last year and they are still one of my favorite pairs. The fit is true to size. 5. M U L E S | These shoes are another item that I already own and love! These heeled mules are so comfortable and perfect for fall. I have already worn them with a dress, jeans, and a jumpsuit. They run slightly small so I would recommend sizing up a half size. 6. B L A Z E R | I bought this blazer last weekend and it's definitely one of my favorite recent purchases. I don't own anything like it so I'm really excited to style it! 7. N E C K L A C E | I've had my eye on this necklace for awhile now and it's finally on sale for less than $20! I think I need to add it to my ever growing circle necklace collection. 8. C A M I | I have a few camis in this style and I can't get enough! This dark pink color is my absolute favorite for fall. I love it!